Join us in the House of Lords on the 17th March to hear about HART’s work and how you can get involved, and to learn about an upcoming visit to our partners in Nagorno-Karabakh. Baroness Cox and HART would like to invite you to join us on a visit to Armenia and Nagorno-Karabakh in the South Caucasus in August 2015. Over the course of this ten day visit, we will visit Yerevan in Armenia and a number of locations in Nagorno-Karabakh, walking through Karabakh’s spectacular mountains and exploring sites of political, historical and cultural significance. This is an opportunity to learn about a fascinating and beautiful part of the world, from those who know it best – those who live and work in Karabakh, and Baroness Cox, who has visited the region 84 times and has herself become a part of its story. 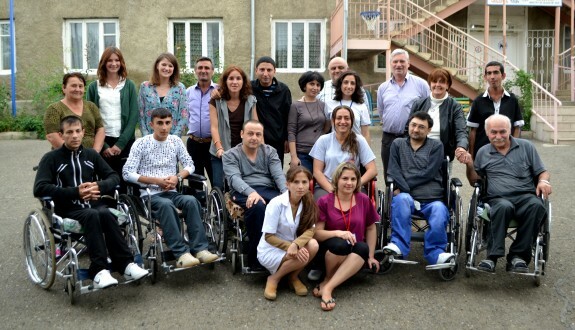 The trip will culminate at the HART-supported Rehabilitation Centre in Stepanakert, where you will meet our partners, see their work first-hand and witness the graduation of a cohort of newly-qualified nurses. You will gain an insight into the political and humanitarian situation in Nagorno-Karabakh, and will experience world-renowned Armenian culture and hospitality, including food, dance and art. For more information about the visit, please contact alice.robinson@hart-uk.org and join us on the 17th March, when you will have the opportunity to discuss the trip with members of the HART team. We will also be sharing updates from HART, and information about how you can get involved with our work. This is a free event, and everyone is welcome. However, for security purposes, we ask that you register here. The event will take place in Committee Room 3a of the Houses of Parliament. The entrance to Parliament is a 5 minute walk from Westminster tube station, on the Jubilee and Circle and District Lines. Please proceed to the main public entrance of the House of Parliament at St Stephen’s Gate and pass through security (please allow at least 15 minutes to go through security). Then proceed through the historic Westminster Hall and up the stairs at the end, to reach the main Central Lobby. Continue straight across the Central Lobby to the end and turn right up the stairs. Follow the stairs up to a long corridor, where all Committee Rooms are located. Proceed to Committee Room 3a. Security staff will be able to direct you to the room if necessary – please tell them that you are attending a meeting hosted by Baroness Cox in Committee Room 3a.